2016 was a record year for Engel & Völkers; revenues generated were in excess of half a billion Euros. 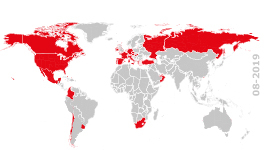 Our brand is represented around the globe with more than 7,500 employees working in over 700 locations. Mohammed Fares is a Senior Sales Consultant at Engel & Völkers Dubai and has been ranked as a Top 10 agent for Engel & Völkers in the EMEA region, due to his outstanding performance. Q1. Which award did you win for Engel & Völkers EMEA region? The award is for being a top 10 agent for Engel & Völkers, in the category of sales. Q2. How did you start working with Engel & Völkers Dubai and why did you choose it as your preferred platform? I chose Engel & Völkers Dubai because it is a very well-known and successful multinational company, which locally, has partnered up with one of the biggest developers in Dubai - Nakheel. Q3. What is the secret of your success? It stems from my constant passion, commitment to my job, great customer service and a strong knowledge and understanding of the market. I take great care in analysing the needs of my clients. Additionally, being an investor in Dubai’s real estate market myself, gives me a deeper perspective from an investor view point and has also contributed towards my success. Q4. What makes this career so exciting for you? This is where my passion lies, I love what I do and hence that excitement translates in to my work. Also, I am genuinely really interested in the Dubai real estate market and active in it as both a broker and an investor. Q5. What is your most interesting experience so far, while working as an agent? One of my most memorable challenges was when I focused my energy on a personal contact who had invested in Dubai's real estate market 10 years ago, but was not serious about investing again and was too busy to meet me at the time. Over a period of 3 months, I shared information with him about the real estate market in Dubai and kept him updated on new development projects. I made sure to consistently follow up with him. Finally, while I was vacationing in LA, he informed me that he is ready and serious about investing. I therefore worked with him right till my very last day in L.A and the deal was closed as soon as I landed at the airport in Dubai. Q6. What are the opportunities of Dubai’s real estate market? Dubai is a great place to invest in real estate. Dubai’s investors have enjoyed some of the highest levels of capital appreciation and rental yields. One of the prime advantages of buying property in Dubai is due to the fact that people from all over the globe are relocating here in search of better employment and business opportunities. Dubai is a cosmopolitan city whose residents originate from over 200 different countries. Dubai's diversification in to aviation, tourism, trade, financial services and other industries, as well as modern infrastructure, security and great leadership; are just some of the key factors behind its success story. Q7. What type of properties are currently highly sought after? Investors who are seeking higher yields when considering investment opportunities in Dubai, should consider a wider range of locations in the city and various alternative asset classes. Some of the most popular areas for residential properties are Dubai Marina, Downtown Dubai and Palm Jumeirah. New developments such as Dubai Hills Estate and Dubai Creek Harbour are also in high demand. Q8. Where do your buyers originate from? They are mainly citizens of the GCC, as well as other nationalities, that I am in contact with in my own network and via referrals. Q9. What is everyday working life like for you as an agent? Every day is a new day full of opportunities and challenges. In fact, I like challenges and I always look for new achievements. I truly enjoy my working life. I arrive to the office at 7:30 AM and usually read various market news, respond to emails and schedule appointments. I prefer to arrange most of my meetings and viewings for the rest of the afternoon. Q 10. What sort of personal skills are necessary to be a successful real estate agent? I believe a successful agent has to have good communication skills and listen attentively to the needs of the client. You need to be able to accurately interpret what your client wants/needs and read in to what they say to you; or deliver a range of options to the client, which covers the possible interpretations. Express opinions in a tactful manner and understand the importance of keeping clients informed about the progress of their real estate transactions. He or she should be honest and trustworthy, regardless of the profit or commission. Being honest and transparent is key to building trust and long-lasting relationships with your clients. Self motivation is also of course, a key trait required to be successful.